"What is the nature of a hero?" 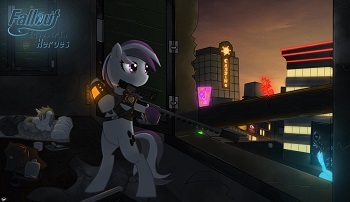 Fallout: Equestria - Heroes is Recursive Fanfiction of Fallout: Equestria written by No One, and is currently a work in progress. Inspired by the heroics of the mysterious mare known as the Stable Dweller, Silver Storm, a guard of the town of Marefort, decides to go on a daring mission to rescue her captured brother. Of course things rarely go as planned and her attempts at heroism drags her into a tangled web of plots and conspiracies as warring factions vie for control over the last great city: Dise. Silver Storm loses her left foreleg to Starmetal poisoning, requiring a cybernetic replacement. Later, she gets a cybernetic replacement for part of hind leg. Beware the Nice Ones: Platinum Haze. She may be an Actual Pacifist, but when she realizes Silver stole med-X from her orphanage, she makes it very clear that she's going to get help for her addiction, weather she likes it or not. Big Bad: Clear Cutt and the Watchers. Boom, Headshot! : How Wildfire dies. The image continues to haunt Silver throughout the story. Breather Chapter: Following the Day of Sunshine and Rainbows. Buffy Speak: "I could feel a piece of steel rebar stabbing into my gut like a stabbing pain thing." And that's just one of several examples. Catapult Nightmare: Averted and Discussed. Silver frequently has nightmares over Wildfire's death, but merely wake up in a shock. After waking up from a nightmare at one point she even felt relieved that this trope didn't happen, noting that it was cliché. Character Development: Roy Mustang eventually gets some. But he literally dies in the same chapter, so the whole thing was pretty pointless. Cyborg: It is Mr. House's requirement for all of his subordinates, including Silver Storm, to have some cybernetic enhancement. Deadpan Snarker: Silver and Flare. Even Evil Has Standards: Avarice still loves Dargonslayer, even after all he's done. Eyepatch of Power: Hired Gun starts wearing an eyepatch due to losing an eye in a failed assassination attempt. She continues to use it even after getting a cybernetic replacement. Fantastic Racism: There is a mutual hatred between Caledonian Ponies and Minotaurs due to fighting each other during and after the war. First-Person Smartass: Silver Storm. Half the story is her snarking to herself about the things or people around her. Footnote Fever: Like the parent story, the story has a tendency to note Silver Storm/Hired Gun's current level. Happily Adopted: Serenity to Silver, although reluctantly for Silver at first. Hidden Depths: The main character seems to come off as an Idiot Hero, judging by her in-story stats, actions, and comments from other characters. However, her first person narration often shows a surprising amount of wisdom, intelligence and knowledge about the situations she finds herself in. Idiot Hero: Decontructed, as Silver fairly self-aware, and the story handles her low intelligence realistically, but she still hits all the notes. Ironic Name: Hired Gun's .50 caliber Anti-Materiel rifle, which she names "Subtlety". One of House's ponies is named Starscream. He dies protecting his boss, loyal to the end. Mama Bear: Silver toward Serenity. Threatening or hurting Serenity is an easy way to get on Silver's bad side. Meaningful Rename: Silver Storm decides to call herself Hired Gun when she takes up mercenary work. Monster Is a Mommy: Inverted. Dragonslayer is the adoptive father of Avarice, a dragon, albeit a baby one. My Significance Sense Is Tingling: Silver can sense when a unicorn is using magic nearby due to her Starmetal poisoning. 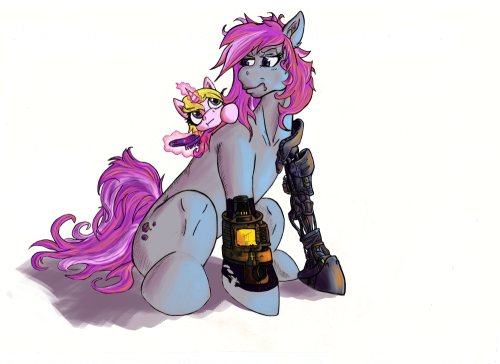 Nightmare Fetishist: Serenity has a certain...fascination with cybernetics. She even begs to watch Silver's cybernetic eye surgery. Polite Villains, Rude Heroes: With few exceptions, Silver is less polite and less educated than her enemies. Punctuated! For! Emphasis! : Silver does this a lot. Shout-Out: One of the characters is named Starscream. Stealth Hi/Bye: The Batmare is prone to pulling these. Somehow without her teleportation. Sympathy for the Devil: Silver says she's sorry to Avarice after Dragonslayer dies, if only because he meant so much to him. This Is Unforgivable! 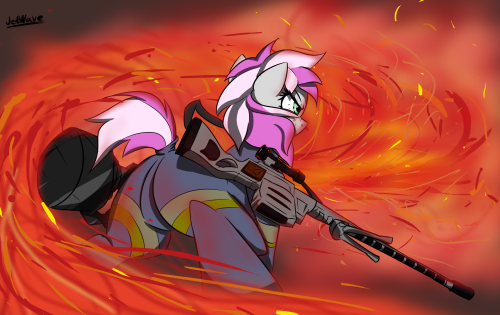 : Platinum Haze feels this way towards Littlepip for killing the Goddess. The Unfavorite: According to himself, Summer Silk was this to his and Silver's mother. Utopia Justifies the Means: The Watchers, Dragonslayer explains. Wham Chapter: Chapter 24 ended with the deaths of many side characters, a war started between two biggest faction in Caledonian Wasteland, a megaspell explosion above Dise, and the reveal of the main villainous faction who works in shadows and cause conflict around Dise. Chapter 29 The full extent of Foundation's death is explored and the chapter ends with the revelation that Silver is the host to a full powered megaspell.